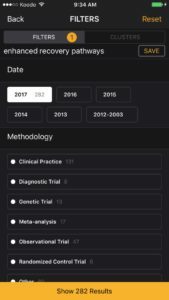 MDPhd has several features to help you with your queries. As you start typing your query you will be prompted with clinical query suggestions. You can scroll up and down and tap on a specific query. Our Semantic Search Engine helps identify relevant and popular medical queries. You may also choose to ignore the suggestions. Our Filter Engine helps you drill down your query results. After typing in your query, tap on the filter icon top right to expose the filters. The ‘Filters’ tab includes ‘Date’, ‘Methodology’, ‘Place’ and ‘Specialty’. You may want to use the ‘Date’ filter to identify the most relevant research in 2017. You may want to use the ‘Methodology’ filter to peruse only Meta-Analyses. 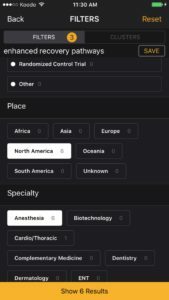 You can use the ‘Place’ filter to filter out studies relevant to your location in the world. 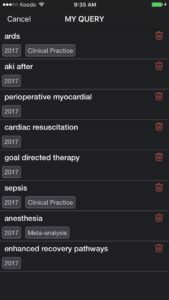 The ‘Specialty’ filter will help you identify research within journals relevant to your field. You can tap on a combination of filters to get more specific. The Cluster Engine helps identify topics related to your query. Within the Filter Engine you will notice a ‘Clusters’ tab. 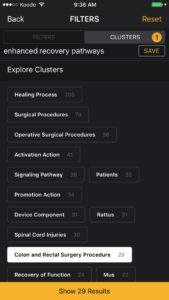 The ‘Clusters’ tab will organize similar research articles into topics. 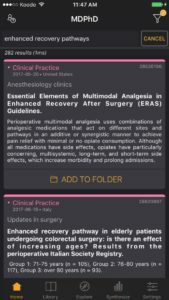 For my query “enhanced recovery pathways” I have identified many clusters of articles. 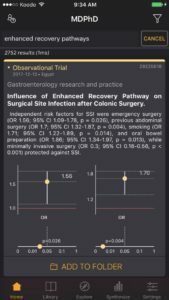 I am particularly interested in a cluster relevant to my own practice “Colon and Rectal Surgery Procedure”. I tap the orange “Show 29 Results” bar to retrieve the most relevant results for this query and cluster combination. The cluster button is also an excellent way to explore topics related to your query. You can also experiment with applying filters AND clusters to your queries! MDPhD also allows you to save queries. 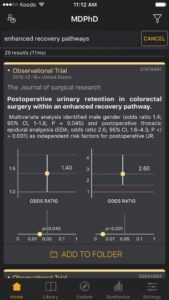 You may be following a certain topic or a specific new drug or you may be interested in following literature related to a patient. Once you type your query, you can enter the Filter Engine. You may save queries with and without filters using the ‘Save’ button. The saved queries appear in the ‘My Query’ icon top left of the ‘Home’ tab. Any of the saved queries can be tapped to retrieve your results. As with every discipline, getting the right answer starts with asking the right questions. 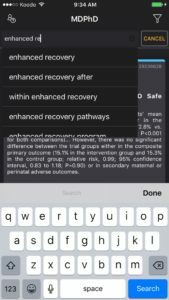 We hope that MDPhD will help you explore and drill down to the research you need with our query features. ©2018 MIFISI Inc. All rights reserved.